Author(s): Rachel A. Powers. Department of Chemistry, Grand Valley State University 1 Campus Drive, Allendale, MI 49401, USA. β-lactam antibiotics have revolutionized modern medicine, but resistance to these drugs is a major public health crisis. Traditionally, class C β-lactamases were referred to as cephalosporinases due to their substrate preference for this particular class of β-lactams. However, the emergence of AmpC enzymes with extended-spectrum activity (extended-spectrum cephalosporinases or ESACs) is particularly worrisome, especially given that most clinical β-lactamase inhibitors are ineffective against these enzymes. This review summarizes structures of several extended spectrum class C β-lactamases and analyzes the structure-function relationship observed among them. Keywords: β-Lactamase, cephalosporinase, extended-spectrum, structure-function, X-ray crystal structures. Affiliation:Department of Chemistry, Grand Valley State University 1 Campus Drive, Allendale, MI 49401, USA. Keywords:β-Lactamase, cephalosporinase, extended-spectrum, structure-function, X-ray crystal structures. Abstract:β-lactam antibiotics have revolutionized modern medicine, but resistance to these drugs is a major public health crisis. Traditionally, class C β-lactamases were referred to as cephalosporinases due to their substrate preference for this particular class of β-lactams. However, the emergence of AmpC enzymes with extended-spectrum activity (extended-spectrum cephalosporinases or ESACs) is particularly worrisome, especially given that most clinical β-lactamase inhibitors are ineffective against these enzymes. 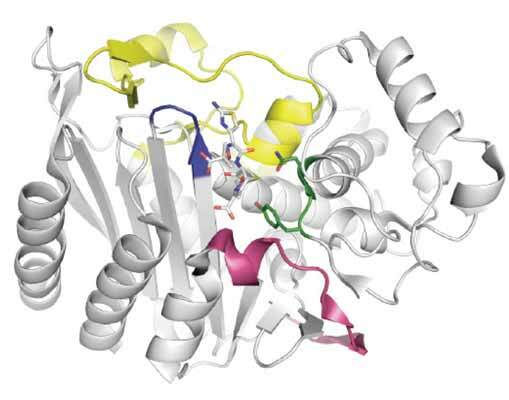 This review summarizes structures of several extended spectrum class C β-lactamases and analyzes the structure-function relationship observed among them.